NATURAL RESOURCES: The Sheephole Valley, for which this wilderness takes its name, separates the Sheephole Mountains and Calumet Mountains. The Sheepholes are a steep, boulder-strewn, granitic mountain mass. The Calumets take on a similar appearance, although rising only halfway to the 4,600-foot tall Sheepholes. Bighorn sheep make their home within the Sheephole range, while the desert tortoise enjoys the valleys below. 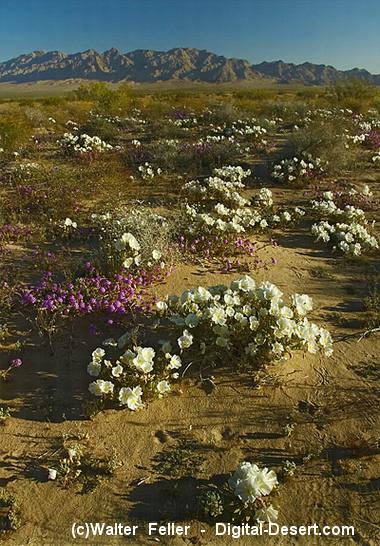 The area's lack of springs and extreme distances make wilderness travel a challenge for the most experienced desert hiker. ACCESS: To access this wilderness, travel approximately 20 miles east of Twentynine Palms, California on State Route 62. The wilderness boundary is just north of the highway's right-of-way for the next 21 miles.